A pair of handsets has been launched in India that runs the gamut from high end to entry level models. Starting with the flagship model, the LG Optimus 4X HD is equipped with a massive 4.7 inch LCD screen with 720p resolution and a high pixel density of 312ppi. Under the hood is the quad-core 1.5GHz Tegra 3 while 1GB of RAM is on board. 16GB of native storage is included. The camera on back is 8MP which captures video at 1080p while the 1.3MP front facing shooter takes self portraits and enables video chat. The 2150mAh battery keeps the phone humming and Android 4.0 is installed. The phone was introduced in Mumbai and soon will be in stores around the country priced at 34,990 INR (approximately $634). If that is too much of a phone for you, you can tell us as we don't judge here. 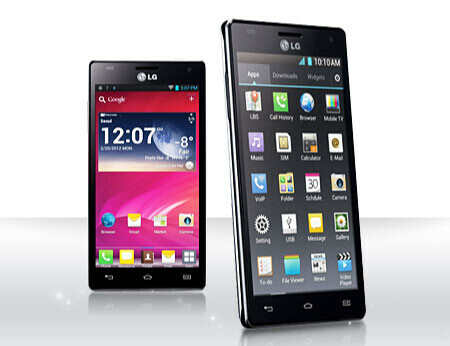 Perhaps the LG Optimus L5 is more your cup of tea. Yes, Android 4.0.3 is aboard (with LG UI 3.0 in tow). Yes, there is a 4 inch display, although it has resolution of just 320 x 480 and a rather low pixel density of 144ppi. A single-core 800MHz Qualcomm 7225A processor tells you everything you need to know. This is a low-end smartphone. The Adreno 200 crunches the graphics and there is 512MB of RAM on board. There is 2.5GB of internal storage that can be expanded with the use of a 32GB capacity microSD slot and a 5MP camera on back takes video in VGA at 30fps. The phone is powered by a 154 mAh battery. The Optimus L5 will cost 13,199 INR ($239). If you live in India, it sounds like LG has a phone for you whether you want the flagship model with the best of what LG can offer, or you're looking to save money with a low-end device. wondering.....(O.o) Optimus L5 - ($239 = INR 13,199) GN7 - ($200 = INR 15,000) .....though GN7 isn't officialy realesed in india yet but in october the price will be approx 15000 (8 GB)..well its avaliable now in online for around 17000. GN7 is a tab. and it's approx 12000 for the 8 GB version. 14000 should give the 16 GB version. But it's still unreleased in India. Who's selling it for 17000 now? Must be an imported one. yah i know GN7 is a tab..lol...indiatimes and ebay is selling it..yes imported...and the 8 gb will cost around 15000 and 16 gb will cost around 19000 after the official realese in india....you cant get it for 12000.
right, but why are you comparing it with LG L5 then? i am comparing the price converted into rupee Optimus L5 - ($239 = INR 13,199) GN7 - ($200 = INR 15,000)......why GN7 will cost more ?? if $239= INR 13199 then $200 equal to should be around INR 10,000.
oh, got it. btw, these prices drop with time, so that can explain the difference. The $239 and $199 are MRPs. This device gets outshined by its Tegra 3 counterpart the HTC One X in almost each and every aspect. Yes, is there a problem Mr. Danny? LG Optimus 4X HD certainly has a impressive specification , will boost sell in India if come up with more competitive price range between 25000 - 30000 Rs. oh fail by lg... sorry but hardware and software isn't lg's strong point! especially the L5! it cost too much and by its hardware like the chipset and its pixels its too much for its price! sorry but this is fail! it cost more than 10,000 philippine peso... you can already get a lenovo P700 on that price, at least it has dual sim capability ICS 4" IPS display and 1ghz of processor! same goes with acer's new leak phone the Liquid Gallant Duo same dual sim ICS 4" display and 1ghz processor! but im betting on the new acer phone! its more cheaper! for the 3rd world countries, dual sim is a need now! The only reason why i would pick the lg 4x over the one x is the small form factor of the optimus 4x, none of the other specs make it stand out.